Strawberry Crater is mixed in among the 600 or so volcanic cones and craters that tend to be between 50,000 and 100,000 years old in the San Francisco Volcanic Field. The northwestern corner of the 10,141-acre Strawberry Crater Wilderness is covered with lava flows while the southern end of the wilderness is filled with low cinder cones. 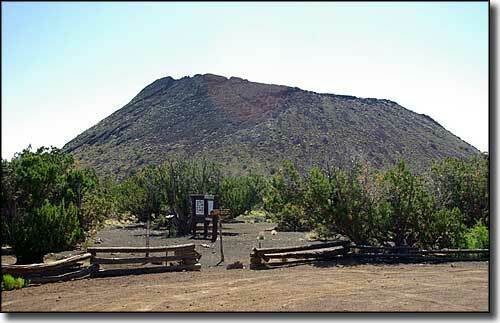 Elevations vary between about 5,500' and 6,526' at the summit of Strawberry Crater itself. The experts say Strawberry Crater is relatively young, formed by volcanic eruptions in the time period between 800 and 1064 BCE. There were several active volcanic periods back then, most of which brought sharp, multi-colored cinders to the surface. Around the crater rim of Strawberry Crater itself you'll find low walls of stacked rock. These seem to be ancient Native American constructions but they seem to be too low for use as part of any habitations. Strawberry Crater Wilderness is mostly gently rolling cinder-strewn hills peppered with pinons and junipers. From the tops of most of these cinder cones you can get good views of the Kachina Peaks, Hopi Buttes, the Painted Desert, and the Little Colorado River valley. The black volcanic soils and twisted junipers at sunrise and sunset make Strawberry Crater Wilderness a favorite with photographers. Summer tends to be quite hot: bring lots of water with you because there's none to be had here. In your journeys across this volcanic moonscape you'll probably come across 900-year-old Sinagua ruins, and even parts of the gardens those ancient people grew using a water-retaining mulch of volcanic cinders. There are numerous paths leading into the area but the only designated trail is on the north side of Strawberry Crater. FR 545 (the Sunset Crater/Wupatki Road) borders one side of Strawberry Crater Wilderness. 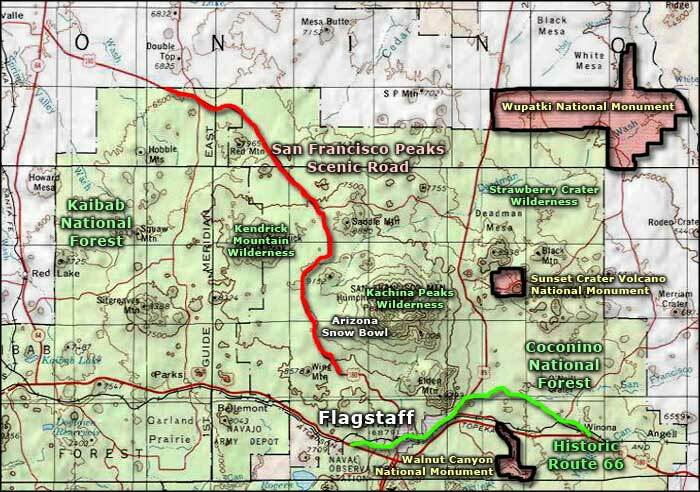 There is additional access from FR's 779 and 546 off of US 89 between O'Leary Peak and the San Francisco Peaks. Upper photo courtesy of Wikipedia userid Arne-kaiser, CCA ShareAlike 3.0 License. Upper left photo of lava flow in Strawberry Crater Wilderness courtesy of the National Forest Service. 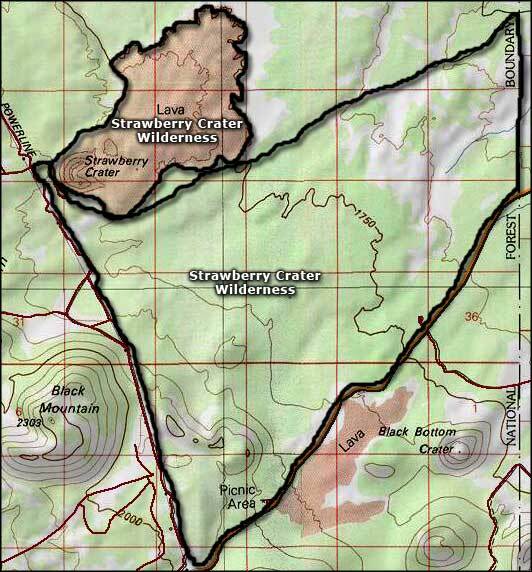 Map courtesy of the National Forest Service. Area map courtesy of National Geographic Topo!